If ever there was one that could do it all, this may be it. The File manager has all the expected functions like cut/copy/paste, create new folders, renaming things and deleting items. 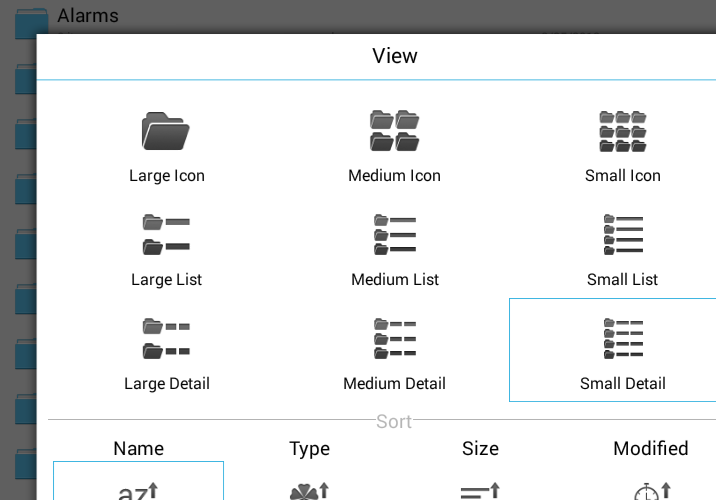 I suspect that many users will try to avoid having to do all this, choosing instead to use the Android Gallery and other tools to view their files, but if you are like me, and you carefully choose and organize your files, a file manager will be a crucial app on your device. Of course, you'll have to first transfer files onto your device, but you can do it, it's easy. Using the built-in Android file tools, you will be hard-pressed to do more than view and delete your files, with very little control over the file structure. This is important because, as an example, if you download many files from the internet onto your device, they will all live within a single folder called 'downloads.' But, if you download a variety of files for different purposes, it can become cumbersome to dig through that folder to find a desired file. Instead, I would use the file manager to copy pictures out into a pictures folder, documents into a documents folder and so on. You may consider this to be a little old fashioned, but it works very well. And to top it all off, ES File Explorer can operate as a Download Manager and can Zip and unZip (or (un)RAR) compressed files. Now that we've got File Management under control, why don't we use it for cloud services and network shares. Actually, that sentence sums up this entire topic. Use the same file management tools for your Google Drive (Docs), Skydrive, Box, Dropbox, Ubuntu One, Sugarsync and more, plus access network shares via SMB, (S)FTP(S) and WebDAV, putting all of your local, cloud and network shared files together in one file management location. Perfect for transferring files to device. Once you are done messing with the tough stuff, the explorer also handles Bluetooth shares. Never mind pushing one file at a time, access all of the contents of a Bluetooth shared folder on another device. Don't forget that this goes both ways, ES File Explorer can turn a folder on your device into a FTP share, so you can access your devices files from your home computer, or other devices, wireless. See how it is done here. So you've organized your files, now what? Use them, of course, which is just a click away. In addition to making available your devices media players and share menu, ES File Explorer also comes with its own photo viewer, basic text editor, music player and video player. These all operate as expected; more than sufficient to get the job done, but lacking in the advanced features that only a dedicated app should provide. The thing is, if you already have multiple video players, for example, installed on your machine, you understand why another is not a bad thing. Another example, if you are like me, you have a music playlist in place on your device, occasionally adding or removing tracks, but always listening to the same playlist. So, when you have need to listen to a single audio file, that may not even be music, you would hate to close out your ongoing playlist just to listen to this one little file. 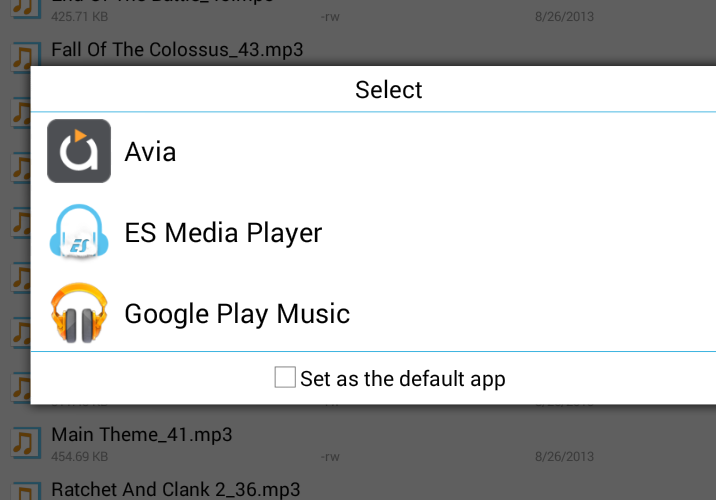 ES File Explorer Music Player to the rescue. Listen to your file here and leave your music playlist alone. TaDa! If you are operating a business device, or often allow a family member to use your device to play games, you may have need to hide some of your files from basic viewing. Don't think this a magical tool, you need simply go into the menu and select 'Hide List' to view all of the hidden files. Please do not hide trade secrets or anything, this is just meant to keep things from being easily stumbled across in basic device usage. This is a much simpler tool than it may sound, simply put, ES File Explorer can take a backup copy of the .apk of your installed applications (some exceptions apply). I find this extremely useful for apps whose developers launch new versions too quickly. I like to update all apps as soon as possible, but never hesitate to use my saved apk in ES File Explorer to roll back an app version or two if the newest version is buggy. It was not long ago that Telcos blocked users from using their phones to tether to other devices. I think that was ludicrous, I totally understand that there was, and still is, some overloading of the infrastructure, but not so that blocking the service or charging astronomical rates was justified. During that time, many devices did not even come with a Tethering or Hotspot application installed. Again, ludicrous. So many third parties created their own tethering apps, including the little known, hidden in the settings, Net Manager that is a WiFi Hotspot application built into ES File Explorer. As with all the other extras in this application, the net manager is not the best tethering app on the market, but still very functional and absolutely a great added value to an already value packed offering. There are still more features in the application, geared toward developers and in conjunction with their task manager application ES Task Manager. And, of course, a multitude of languages, gestures and visual layouts and themes.